Journalism educators attending last week’s conference held by the Association for Education in Journalism and Mass Communication were greeted with news of the shrinking population in their classrooms. 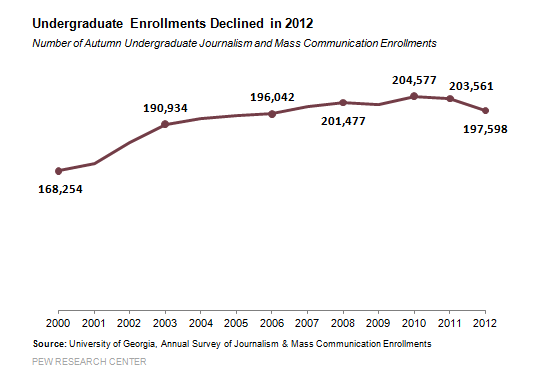 According to a new report from the University of Georgia (pdf), undergraduate enrollments in journalism and mass communication programs declined 2.9% in 2012, marking only the second time in two decades that they have dropped for two consecutive years. They fell 0.5% in 2011. The drop is “significant,” says Lee Becker, the director of the James M. Cox Jr. Center for International Mass Communication Training and Research at the University of Georgia. At the same time, the report finds that the number of full-time faculty in communications and journalism programs increased by 5.9% in 2012. But in the middle of a rapidly changing media environment, are students finding their journalism education worthwhile? Do j-school graduates feel prepared for their first day on the job? Findings in another new report from the Cox Center on a range of questions about the quality of their education suggest that most recent journalism and mass communication graduates appear quite pleased with their training—with a notable exception. In the survey of 1,823 undergraduates, more than seven in 10 (70.8%) students with degrees in journalism or mass communication agreed or strongly agreed with the statement that their coursework provided skills needed in the current workplace. In addition, 83.1% of the recent graduates agreed or strongly agreed that their instructors were current in their knowledge of the subject matter. Nearly as many—78.5% of the 2012 graduates—agreed or strongly agreed that their alma mater’s facilities and equipment were up to date. When asked whether their coursework had included too little substantive material about the process of communication, 67.6% either disagreed or strongly disagreed while only 11.8% agreed or strongly agreed. There was however, one significant outlier when it came to the high marks the schools received from the recent grads. Nearly four in 10 (39.5%) agreed or strongly agreed that their coursework included too little technical training. Only slightly more, 41.9% disagreed or strongly disagreed with that statement. Jan Lauren Boyles is a Google Journalism Fellow with the Pew Research Center's Project for Excellence in Journalism.